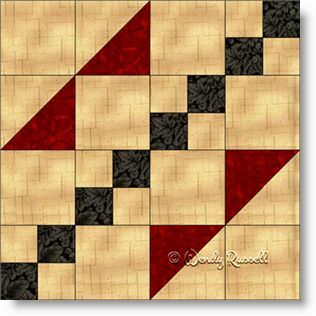 I love quilt blocks like this Road to Kansas block because of their obvious directional nature. This presents all sorts of interesting possibilities when it comes to making your quilt. At first glance, this four patch block is pretty straightforward. It contains only half square triangles and two different sized squares. The fun begins when you start to rotate the blocks in your quilt placement. The two sample quilts illustrated show you exactly what I mentioned above. One quilt is set on point while the other features the blocks in a side by side format. Both feature some of the blocks rotated by 90 degrees which in turn makes for lots of variations. What can you come up with?